The group was set-up as a “self-help” group by a small nucleus of amateur concertina enthusiasts to service the counties of Beds, Bucks and Herts. 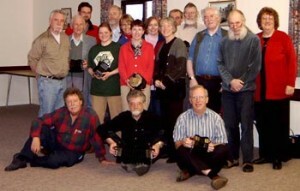 The group’s name, “The Chiltern Concertina Group”, resulted from a competition and was derived from a combination of The Chilterns (low lying hills running through Hertfordshire, Bedfordshire and Buckinghamshire) and concertina. It quickly became abbreviated to The Chiltinas by which name it is now generally known. The Group was the brainchild of Geoff Thorp, who sent out invitations in a letter dated 4th February 1997 to anyone interested in starting a new concertina group, to meet on Sunday 22 February at his home Witchway Cottage in Maulden. One of the highlights of the meeting apart from agreeing to start a group and playing some tunes were the cakes that Geoff’s wife, Carol, baked for the mid-meeting tea break – a custom that was to continue for many years. After about 12 months and more people joining the group it became apparent that the “Club Room” (an annex at Geoff’s house) was no longer big enough to hold us all and it was decided to hire St. Mary’s Church Hall Maulden for future monthly meetings. These are held on the second or third Sunday of the month between 2 pm and 6 pm. There were very few concertina groups at that time and some members travelled quite long distances (up to two hours drive for some) just to be able to meet and play with like minded people. In the early days, Jon McNamara produced The Chiltina Chronicle to keep members who had been unable to attend informed, and also as a record for the group. Membership numbers dwindled for a time as people moved to other areas or joined groups closer to home, so the need for The Chiltina Chronicle reduced and it faded out. The group caters for all concertinas systems – English, Anglo and Duet and for all abilities from beginners to advanced players. On the last meeting in the year, the group gave a carol concert to the residents of a local care home but in recent years has played for the Leonard Cheshire home in Ampthill. We play mostly folk tunes but have also played theme tunes, old time music hall melodies and some classical pieces. Over the years the Group has also played for the Maulden OAP party and put on a performance for the year 2000 celebrations. Sadly our founder Geoff Thorp passed away in 2015 and his wife Carol eventually left the area to be closer to her daughter but the group is still flourishing. Recently the membership has grown and on a good day we can have 12 members turn up. The membership subscription can vary from year to year as the cost to hire the hall (about £350) is divided equally among the regulars and was £25.00 for 2016. 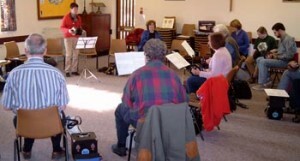 The group welcomes new members, whether experienced players or absolute beginners. We are able to teach both the Anglo and English systems and have a few loan instruments available to help you in those early stages of learning and in deciding which system to choose. See the invitation to the inaugural meeting dated 4th February 1997 (PDF format). Pauline de Snoo led a workshop at Chiltinas on 16th March 2003. See the photos below.